On 23 April, I invited my team over to play with all the new goodies I got in my PPP. Today, I have chosen to show you the Lovely Inside & Out Stamp Set & matching Lovely Words Thinlits. 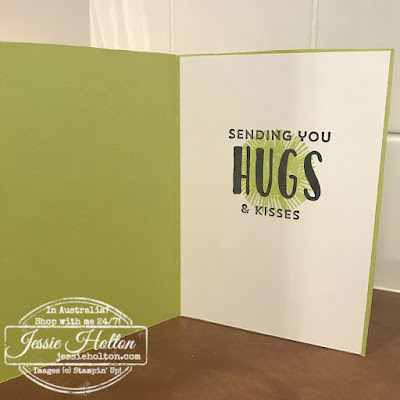 I have used the new Lemon Lime Twist cardstock & ink with the paper coming from the gorgeous new Pick A Pattern Designer Series Paper. The Lovely Words Thinlits leave the word & cut the shape from above & below. You can also nestle these in the Layering Shapes Thinlits. I've made this card into a shaker card with the addition of acetate sheet, metallic sequins & foam strip adhesive. 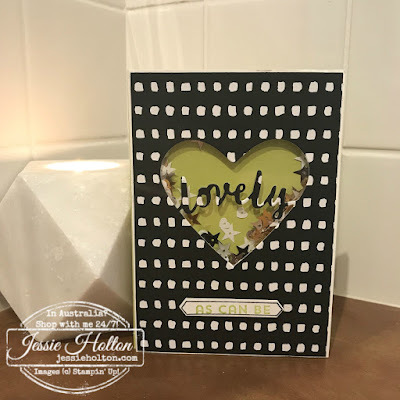 The sentiment on the front comes from the Lovely Inside & Out stamp set. The border stamp comes from the Thoughtful Banners stamp set & I've cut it out with the Classic Label Punch. I've also stamped the inside with the Lovely Inside & Out stamp set to match. These products go on sale to the public on 1 June or you can join my team & order them today! 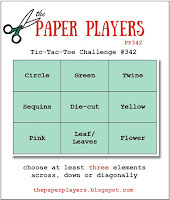 I've entered this card into the Paper Players Tic Tac Toe Challenge - Sequins, Die Cut, Yellow (although the new cardstock looks a bit more green in the pics, it's really almost yellow in real life haha)!